Have you ever thought about publishing a book? I'd love to see it one day. Sorry if this question has been asked and answered before. 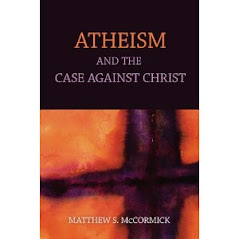 My book, Atheism and The Case Against Christ, is coming from Prometheus Press next spring. I'm assuming you are still in the process of writing and editing? That's about a year away. Will you be posting previews or any overviews of the book in the near future as we get closer to the release? The book is written. I'm doing final edits for Prometheus now. There are numerous posts on the blog here in recent months about it. I'll have updates, and a new website to promote it soon. The belief of hundreds of millions of Christians that Jesus was resurrected from the dead is unfounded. Believing the resurrection on the evidence we have--primarily a small group of testimonial stories recorded in the Gospels—is inconsistent. In other cases such as the Salem Witch Trials where we actually have better evidence in terms of quantity and quality, we reject the analogous conclusion that they really were witches. That is to say, even by the Christian’s own standards, belief in the return of Jesus from the dead is unreasonable. Atheism and The Case Against Christ also gives a arguments that the information we have about the resurrection is unreliable: the alleged eye-witnesses would have been vulnerable to bereavement hallucinations, the Ashe Effect, Confirmation Bias, source amnesia, and an over-enthusiasm for miracles (the Lourdes Problem). Likewise, the transmitters of the story would have embellished, omitted, amplified, and filtered. Given the history of the manuscripts, even if there was a resurrection, the layers of doubt that intervene between us and the alleged event force us reject the central and essential doctrine of Christianity. More generally, problems with ancient religions, miracles as acts of God, and faith force us to the broader conclusion of atheism. Its resemblance to so many other natural (not supernatural) religions and “dead” gods presents a problem for Christianity; performing miracles cannot be reconciled with the notion of God as the all powerful, all knowing creator of the universe; faith is an inadequate response to justify Christian or any other religious belief; and non-literal approaches to Christian doctrines like the resurrection must also be rejected. There are many books about the history of Jesus, the resurrection, and atheism. But none of them frames the questions or answers them with the fresh, objective, and accessible insights of Atheism and the Case Against Christ. Is it reasonable for the people who believe that Jesus returned from the dead on the basis of the information that is available to them? Is the information about Jesus that has been relayed to us over the centuries of sufficient quantity and quality to justify the resurrection? What light does contemporary research about human rationality in behavioral economics, empirical psychology, cognitive science, and philosophy shed on the resurrection and religious belief? Would the all powerful creator of the universe use miracles to achieve his ends? What are the paradoxes or internal problems created by believing by faith? Thanks for posting that. Sounds great. Hope it has lots of new and refreshing ideas and takes on this topic. That teaser sold me. Can't wait to see the finished product. Beware, thou art mortal, beware thou art mortal, beware thou art mortal! It concerns theology. I was debating a friend, and used an argument that was essentially that the best philosiphers of religion were conservative chrisians, so evolution, if true, most likely defeats christianity. However, they claimed most theolagians disagree with fundamentalist christianity. So, I am curious as to what type of christianity philosiphers of religion and theologians subscribe to. Do they think the bible is innerant- or are they more liberal in their approach. Do they have a consensus or not? Good questions, Andy. About 40% of the population are Young Earth Creationists, but among the educated, and even among philosophers of religion who are Christian or who believe in God, that number is much lower. They mostly accept that the universe is 13.7 billion years old and that life evolved on Earth for 4 billion years until now. How they think that can be reconciled with Christian doctrine, I don't know. At the very least they don't think that the Genesis story of creation and Adam and Eve are literal. Oh... I just found it odd that so many prominent philosiphers of religion (plantinga, WLC, etc) are "old earth" creationists and biblical literalists. Any idea why that is? thx, and look foward to the book! Sorry, I wasn't clear. YECreationists believe the whole silly Genesis story. But Plantinga and Craig and most philosophers of rel reject that and accept an old Earth and evolution. Oh- I thaught Plantinga and Craig accepted the old earth hypothosis but rejected evolution. Craig has debated the issue before arguing against evolution, and Plantinga has criticised it as well (unless he chaged his mind). Holy crap, that's a lot of links, AIG Busted. Ummm, I don't keep up on the details of Craig's craziness. It seems to me that, at a minimum, accepting evolution is the lower threshold for being taken seriously as an educated grown up. Even the Pope has grudgingly accepted evolution. Denying evolution at this point is like denying oxygen. Plantinga has suggested that God guided the process of evolution by directing the random mutations from generation to generation. About 4 in ten Americans acknowledge evolution but think that God had some influence on it. Oh... Well- I guess they use theology to get around it. Although I've always been confused by evangelical scholars in theological seminaries who wholeheartly accept everything the bible says. Sorry, it just seems so strange that there are so many evolution denying apologists I've seen on the internet. Anyways, know of any good criticisms of theological arguments? I can only guess that theology isn't discussed much in the philosiphy of religion, as it doesn't really focus on arguing for religion asit does arguing that religion is sound (and not detrimented by it's little corroborating evidence).t in this assessment?